The next day, we all woke up to the crow of a rooster, a new adventure that some of us grew to love and some of us grew to hate (I see you, Lissy). After meeting Loveness, our cook at the SEGA lodge, and enjoying a lovely breakfast (thank you so much, Loveness! ), we prepared for our day with lots of bug spray and sunscreen. The comfortable morning silence was broken by a sharp thud and an “AHHH, MY EYES! !,” which was Penelope spraying bug spray into her eyes. After some intense eye washing, everyone was ready to go. The girls met us at the gate, and we all decided later that one of our favorite sights from the trip was the SEGA girls waiting for us outside the SEGA lodge. 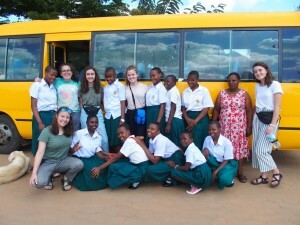 The first item on the agenda was a school tour, which was led by the girls and by Rhona and Isabella, and the tour was very fun for all of us. We had a chance to continue getting to know the SEGA girls while walking from place to place. A highlight of the tour was seeing the chicken coop, where Maria explained that the smart local chickens and the dumb international chickens had separate enclosures to ensure the local chickens didn’t bully the international chickens, because the international chickens were easy to catch and didn’t know enough to run away if something were chasing them. There are some remarkable similarities between West High School and the SEGA Girls’ School – for example, both have school stores that are in part run by the students, and both have strong business programs. Basically, the school tour was a fun way to talk about the similarities and differences between SEGA and West. After the school tour, we headed to the kitchen to learn how to make chapati! Chapati, as we learned, is similar to a pancake – essentially, dough fried in a circle. We split into groups – some made chapati while others played Heads Up!, a game that the SEGA girls brought out – and this was hilarious, because the MEGA girls had talked about downloading HeadsUp to play with the SEGA girls too! HeadsUp is a game that was pioneered by Ellen DeGeneres, in which you have a card of an object on your forehead, and you have to ask yes/no questions to the people around you to guess what the card says. The best was when someone wearing a card took a turn making chapati… the photos are great. I (Zoe) was a bicycle, and I had to have a hint after exhausting the usual questions like “Is it alive?” and “Do you find it in a house?” After a quick lunch, it was time for the trip to the town of Morogoro to shop for fabric and see the sights. We piled into the SEGA bus, and had fun chatting and making friendship bracelets on the ride into town. All of the SEGA girls had put on their school uniforms, which we all thought looked very professional and pretty. Isabella took us to the favorite kanga store, where each one of us bought a kanga, aided by the girls, who helped translate the Swahili sayings on each fabric. MEGA girls (and especially our two chaperones) also focused on buying good fabric to be made into scrunchies, as one of MEGA’s most successful fundraising events is making and selling scrunchies at West High School’s annual pottery/craft auction. 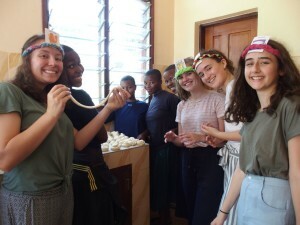 Having scrunchies made out of Tanzanian fabric will definitely boost our sales! After the fabric market, we headed to the food market, where a kind vendor handed Tatum a bao-bao, which the girls reassured us was good and sweet. It appeared to be a pink square and turned out to taste very sweet. It is made out of the fruit of baobab trees, apparently. When we got back to SEGA everyone dispersed back to their rooms for dinner, and we agreed to meet up in one of the classrooms for evening activities. But first the water cooler in the SEGA lodge needed refilling, so Maria and Sarafina kindly got out their own kangas and carried the water jugs back to our lodge for us. They twisted the fabric into a circle, on which they placed the water jugs. It was then that we began to truly see the many uses of kangas! The MEGA girls quickly caught on, becoming masters at balancing their own water bottles on their heads. However, carrying a water bottle is slightly less impressive than carrying a full cooler jug. Girls at the fabric store. From left – Penelope, Amina, Lissy, Maria, Debrah, Sarafina, Angie, and Zunna! After dinner and some relaxation, we met up in a Form 2 classroom to do some decorating of our MEGA “thank you” banner: we plan to give photos of all of us and the banner to the people who helped MEGA get to Tanzania. Everyone had a great time writing little messages and drawing on the poster, and it was very relaxing and fun to draw while listening to music, DJ’ed by Lissy. Some of the messages the girls left us on the poster were inspiring and deeply moving: quotes ranged from “What goes around, comes around” to “Dreams are made true by you and us.” There were also a lot of cool drawings – many flowers and spiral designs (MEGA girls were definitely outdrawn). Needless to say, MEGA girls were very happy to take home that banner as a souvenir from our time at SEGA. It was also fun to see what American music the girls knew and did not know (Beyoncé is universal; can’t say we were surprised). We had fun learning about SEGA girls’ music tastes, too (in fact they all love Bongo Flava). Tatum and ZaiNaBo even got to practicing dancing! Faith knew that it was time for bed when Tatum started to yawn every 5 minutes. After a full day of crafting, adventuring, and chatting, everyone fell asleep right away! Stay tuned for the final part tomorrow!